BACKGROUND AND PURPOSE: Fusiform aneurysms and ultrawide-neck circumferential aneurysms are still some of the most challenging lesions. The aim of this study was to investigate the efficacy and feasibility of the use of multiple overlapping Enterprise stents with coiling for the treatment of fusiform or ultrawide-neck circumferential aneurysms. MATERIALS AND METHODS: Twelve consecutive patients (9 men and 3 women; mean age, 56 years) with fusiform (n = 5) or ultrawide-neck circumferential (n = 7) aneurysms were treated with 2–3 overlapping Enterprise stents and coiling. The feasibility of this procedure and the clinical and angiographic outcomes of this technique were retrospectively evaluated. RESULTS: All patients were successfully treated by using this technique without any complications. Posttreatment angiographic results revealed grade 4 occlusion of the aneurysm in 6, grade 3 in 4, and grade 2 in 2 patients. Clinical follow-up was performed in all patients (mean, 16 months; range, 5–24 months). Nine patients had an mRS score of 0. Two had an mRS score of 1, one of whom had an initial mRS score of 2 due to the mass effect of a giant aneurysm; the other had a recurrent aneurysm presenting with SAH 5 years after clipping. Angiographic follow-up was performed in 10 patients at 6–20 months posttreatment. Nine had stable or improved occlusion, while 1 had a minor recurrence. CONCLUSIONS: In this small series, multiple overlapping Enterprise stents with coiling were a feasible and effective option for the treatment of fusiform and ultrawide-neck circumferential aneurysms. Further experience and follow-up are required to document the long-term efficacy of this treatment. Endovascular treatment is increasingly used for ruptured and unruptured intracranial aneurysms. Rapid development in both the endovascular techniques and devices has allowed the treatment of most of wide-neck aneurysms.1 Nevertheless, fusiform aneurysms and ultrawide-neck circumferential aneurysms, in which the aneurysm sac encompasses the parent artery >180°, are still some of the most challenging lesions. Even though a stent-assisted coiling technique has been used to treat such aneurysms, the coil loops overlapping the parent artery in working projection cannot be avoided, which in turn makes the operator hesitate in coil packing, fearing that the coils may encroach on the parent artery lumen. Although a down-the-barrel view may often help to differentiate the parent artery lumen from coils,2 it is not always available as a working projection. Balloon-in-stent techniques have been used to secure the parent artery lumen when treating ultrawide-neck and fusiform aneurysms.2,3 However, the balloon-in-stent technique is complex and is occasionally difficult, especially in cases in which the stented segment of the parent artery is tortuous.4 Recently in our country, the self-expanding Enterprise stent (Cordis, Miami Lakes, Florida) was introduced. This stent leaves the stent-loading wire in situ following stent deployment. The presence of the stent-loading wire increases the ease with which a second stent can be inserted. Thus, a stent-within-stent technique can be used whenever needed, without the requirement of an exchange wire. This ability of the Enterprise stent allows secondary maintenance of the parent artery lumen without requiring the use of an additional balloon during the procedure. In this study, we report our experience in treating 12 patients with fusiform or ultrawide-neck circumferential aneurysms by using multiple overlapping Enterprise stents with coiling procedures. The institutional review board approved this retrospective study with a waiver of patient informed consent. Between November 2008 and October 2010, 12 consecutive patients presenting with fusiform (n = 5) or ultrawide-neck circumferential (n = 7) aneurysms were treated with 2 or 3 overlapping Enterprise stents and coiling in 3 tertiary referral hospitals. The patients included 9 men and 3 women, aged 30–71 years (mean, 56 years). Ten patients presented with unruptured aneurysms, 1 patient presented with an unruptured recurrence 2 years after clipping of the initially ruptured aneurysm, and 1 patient presented with a ruptured recurrence 5 years after clipping of the initially ruptured aneurysm. 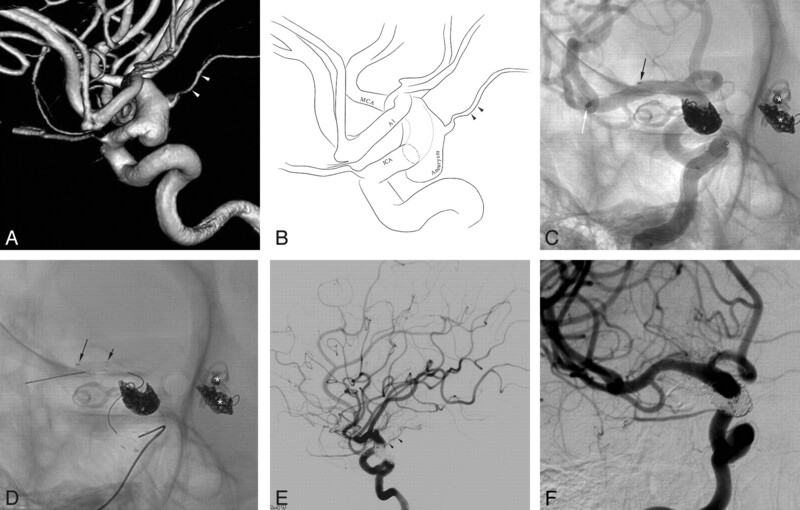 All aneurysms were fusiform or ultrawide-neck circumferential morphology that encompassed the parent artery >180° on the cross-sectional view of a 3D volume reconstruction. All patients with unruptured aneurysms were given antiplatelet medication (100–325 mg of aspirin and 75 mg of clopidogrel [Plavix]) for 3–5 days before the procedure. The patient with SAH was given a loading dose of antiplatelet medication (325 mg of aspirin and 300 mg of Plavix) following completion of the procedure. Dual antiplatelet medication was maintained for 12–24 weeks at the physician's discretion and then was changed to aspirin monotherapy indefinitely. After insertion of the guiding catheter, an intravenous loading dose of heparin (3000–5000 IU) was administered, followed by a maintenance dose of 1000 IU every hour. After the guiding catheter (Shuttle-6F, Cook, Bloomington, Indiana; or Envoy 6F, Cordis) was inserted into the parent artery, a Prowler Select Plus microcatheter (Cordis) was navigated across the aneurysm neck portion to a distal branch of the parent artery. A second microcatheter was inserted into the aneurysm sac, and the initial Enterprise stent was deployed, bridging the aneurysm neck. After the first stent deployment, the Prowler Select Plus microcatheter was re-advanced to the initial position over the stent-loading wire, which was left in situ within the deployed stent; then coil embolization was performed as compactly as possible, including the aneurysm neck portion, which encompassed the parent artery >180° (Fig 1D). Finally, a second Enterprise stent was introduced and was deployed in an overlapping manner (Fig 1E). If needed, this procedure was repeated to insert >2 overlapping stents. A 71-year-old man (patient 3) presenting with a giant aneurysm with partial thrombosis in the left anterior cerebral artery second portion. A, Brain MR imaging shows a giant 65-mm aneurysm with partial thrombosis in the left frontal region with marked perianeurysmal edema. B−D, The working projection (B), cross-sectional view (C), and its illustration (D) of 3D reconstruction reveal a large aneurysm sac (approximately 20 mm in diameter) at the left ACA A2. E, Stent-assisted coil embolization was performed after the Prowler Select Plus microcatheter was re-advanced to the initial position over the stent-loading wire of the first Enterprise stent. F, A second Enterprise stent was deployed by using the stent-within-a-stent technique following compact coiling of the aneurysm neck encompassing the parent artery (white arrow). Black arrows indicate the distal markers of 2 overlapping Enterprise stents. G, Final control angiogram reveals complete occlusion of the aneurysm sac and a well-preserved parent artery. H, The 6-month follow-up angiogram reveals a neck recurrence, but the follow-up T2WI MR image (not shown) revealed markedly decreased perianeurysmal edema. The patients were assessed on admission and during and after the treatment. Adverse events occurring during or after treatment were recorded. Each patient was followed clinically as an outpatient and was evaluated according to the mRS.6 Angiographic follow-up was scheduled at 6 months and then at 12–18 months after discharge. All patients were treated successfully by using this technique without any complications. The Table summarizes the characteristics of the patients and clinical and angiographic outcomes. The immediate posttreatment angiographic results revealed grade 4 occlusion of the aneurysm in 6, grade 3 in 4, and grade 2 in 2 patients. Clinical follow-up was available in all patients (mean, 14 months; range, 3–24 months). Nine patients had a clinical outcome mRS score of 0, and 2 patients had an mRS score of 1, one of whom had an initial mRS score of 2 due to mass effect of a giant aneurysm. The other patient with an mRS score of 1 had a recurrence presenting with SAH (Hunt and Hess grade, 3) 5 years after the clipping of a ruptured aneurysm. Angiographic follow-up was performed at least once in 10 patients after 6–18 months, while the follow-up angiographies are not yet performed in 2 patients. Of the 10 patients with angiographic follow-up, 8 had stable or improved occlusion, while 1 had a neck recurrence (Fig 1H). Two of the 10 patients revealed mild (<50%) and severe (>70%) degrees of in-stent stenoses but have remained asymptomatic following the initial treatments. A 71-year-old man (patient 3) presented with an intractable headache and confusion. Brain MR imaging revealed a 65-mm giant aneurysm with thrombosis and marked perianeurysmal edema in the left frontal region (Fig 1A). Angiography revealed a large aneurysm sac (approximately 20 mm) at the left anterior cerebral artery, A2 portion (Fig 1B−D). As described in the “Treatment Technique” section, stent-assisted coil embolization was performed as compactly as possible, including the aneurysm neck portion that encompassed the parent artery nearly entirely circumferentially (Fig 1E–F). Then, to preserve the patency of the parent artery and to enhance the flow-diversion effect, we deployed a second Enterprise stent by using the stent-within-a-stent technique (Fig 1F). A final control angiogram revealed complete occlusion of the aneurysm sac and a well-preserved parent artery (Fig 1G). The patient's symptoms were almost completely resolved, with the exception of a mild headache at the time of discharge. An angiogram at 6-month follow-up (Fig 1H) revealed a neck recurrence; however, a follow-up T2WI MR image (not shown) showed markedly decreased perianeurysmal edema. The patient experienced no subsequent neurologic symptoms with the exception of a mild headache during the 20-month period following discharge (mRS, 1). A 63-year-old man (patient 5) was admitted for the treatment of a progressively enlarging unruptured basilar artery tip aneurysm. On the 1-year follow-up angiogram, the aneurysm had enlarged from 8 to 13 mm, and circumferential encompassment of the left posterior cerebral artery had developed (Fig 2A). With the technique described above, the aneurysm sac was near completely embolized, while the encompassed left posterior cerebral artery was preserved (Fig 2E). The 18-month follow-up lateral angiogram (Fig 2F) revealed stable occlusion of the aneurysm and a patent left posterior cerebral artery and its branches. 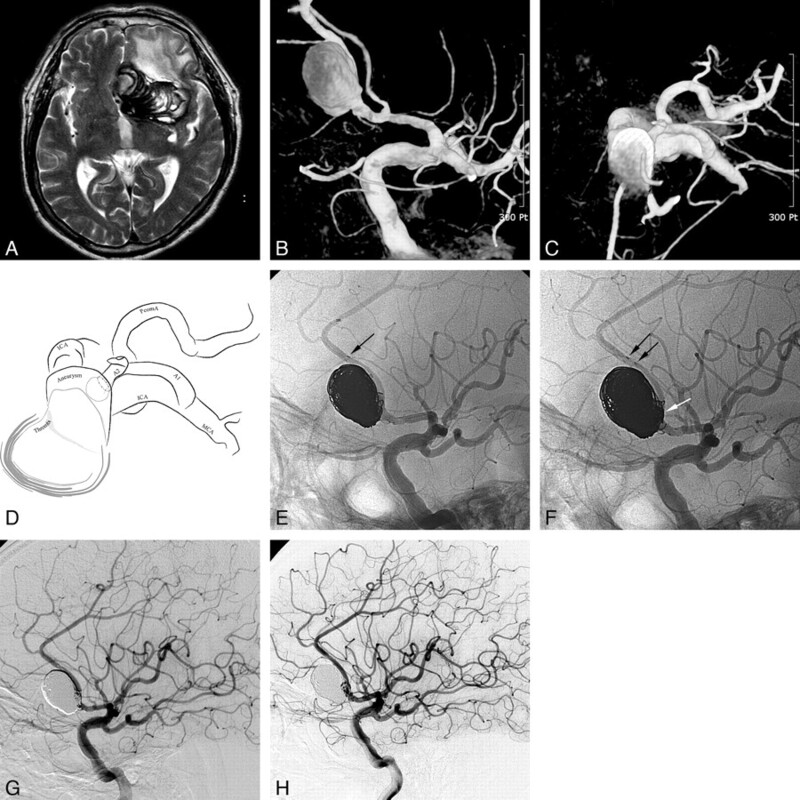 A 63-year-old man with a progressively enlarging unruptured basilar artery tip aneurysm. 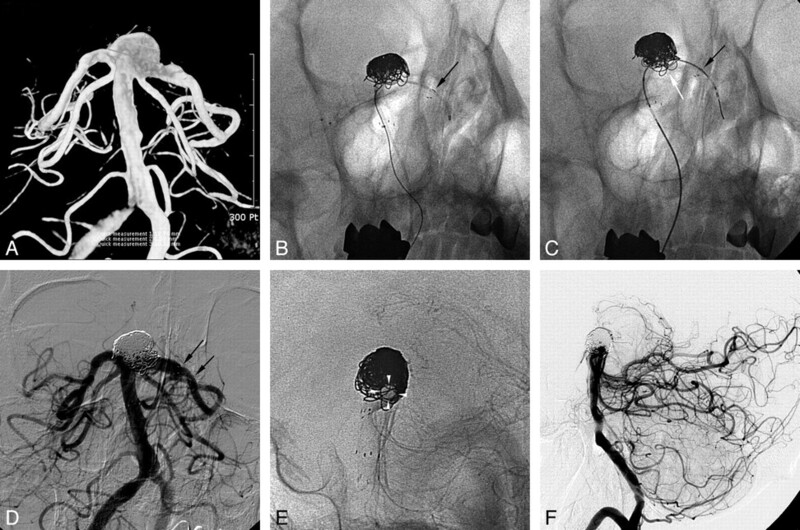 A, The aneurysm had increased from 8 to 13 mm in a 1-year follow-up angiogram, and a circumferential encasement of the left PCA had developed. B, Stent-assisted coil embolization was performed after the Prowler Select Plus microcatheter was re-advanced to the initial position over the stent-loading wire. C, A second Enterprise stent was deployed following the coil embolization. D and E, Final control angiogram (D) reveals near-complete embolization of the aneurysm sac and a well-preserved left PCA (E, white arrowheads). 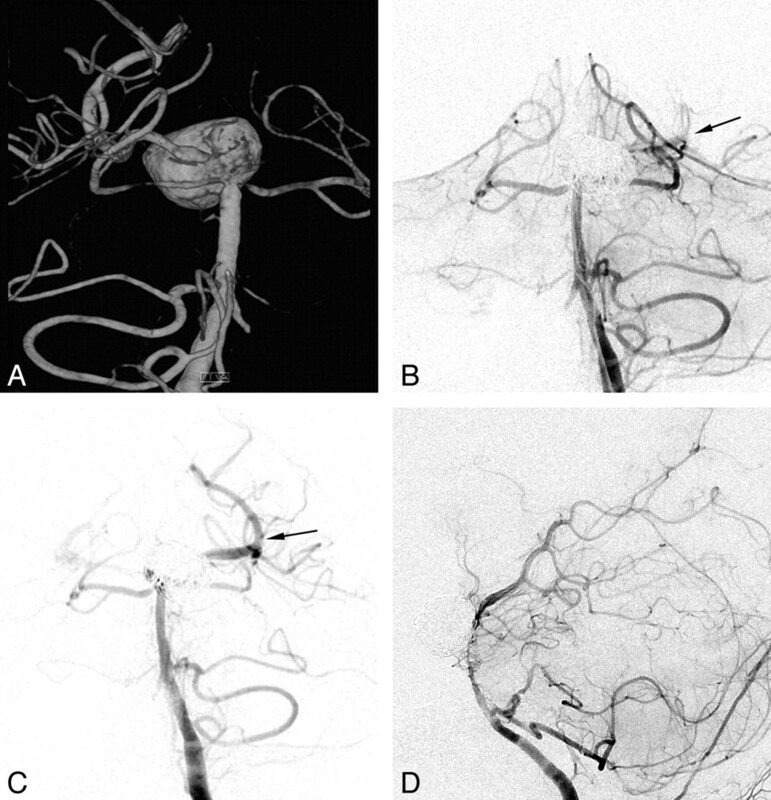 F, The 18-month follow-up lateral angiogram reveals a stable state of the aneurysm occlusion. A 30-year-old woman (patient 8) was admitted due to the presence of several postclip recurrent aneurysms in the left posterior communicating artery, left anterior choroidal artery, and right anterior choroidal artery. The patient initially presented with an SAH 5 years before admission for the recurrent aneurysms. Angiography at that time in another hospital revealed a ruptured left posterior communicating artery aneurysm as well as 2 unruptured saccular aneurysms in the left anterior choroidal artery origin and right anterior choroidal artery. This patient had initially undergone surgical clipping for the treatment of these aneurysms in that hospital. A follow-up angiogram 2 years after clipping revealed recurrent saccular aneurysms in the left posterior communicating artery (not shown), the left anterior choroidal artery (not shown), and the right anterior choroidal artery. The recurrent right anterior choroidal artery aneurysm was fusiform and incorporated the right anterior choroidal artery (Fig 3A,-B). The recurrent left posterior communicating artery and anterior choroidal artery aneurysms were retreated with balloon-assisted coiling, resulting in complete occlusion on the immediate posttreatment angiogram (not shown). The remaining fusiform aneurysm was treated with 2 overlapping Enterprise stents and coiling as described above in the same session (Fig 3C,-D). The immediate posttreatment angiogram revealed grade 3 occlusion of the fusiform aneurysm and a well-preserved right ICA and right anterior choroidal artery (Fig 3E). The patient has not developed subsequent neurologic symptom. The 20-month follow-up angiogram revealed a stable state of the aneurysm occlusion (Fig 3F). A 30-year-old woman with a postclip recurrent aneurysm in the left posterior communicating artery, left anterior choroidal artery, and right anterior choroidal artery. The 3D reconstruction image (A) and its illustration (B) reveal a fusiform aneurysm of the right distal internal carotid artery with incorporation of the right anterior choroidal artery. C, Stent-assisted coil embolization was performed after deployment of the first Enterprise stent and re-advancement of the Prowler Select Plus microcatheter. White and black arrows indicate distal markers of the re-advanced Prowler Select Plus microcatheter and the deployed Enterprise stent, respectively. Asterisks indicate the coil-embolized left posterior communicating artery and anterior choroidal artery aneurysms. D, A second Enterprise stent was deployed after completion of coil embolization. The black arrows indicate distal markers of 2 overlapping Enterprise stents. E, Final control angiogram reveals near-complete occlusion of the aneurysm sac and preservation of the right internal carotid artery and the anterior choroidal artery (arrowheads). F, A 12-month follow-up angiogram in a working projection shows stable aneurysm occlusion. A 45-year-old man (patient 7) was admitted for the treatment of an unruptured large aneurysm at the basilar artery tip. 3D reconstruction of a rotational angiogram revealed a 15-mm basilar tip aneurysm that encompassed the basilar artery and the left PCA >180° (Fig 4A). During the stent-assisted coiling, though blood flow through the stented basilar artery to the left PCA was compromised (Fig 4B), a second Enterprise stent deployment immediately resulted in complete recanalization (Fig 4C). For fear of further parent artery compromise occurring, the coiling procedure was stopped after a second Enterprise deployment. The immediate posttreatment control angiogram revealed grade 2 occlusion of the aneurysm sac and normal blood flow through the stented basilar artery to the left PCA. The 1-year follow-up lateral angiogram showed grade 4 occlusion of the aneurysm sac but with a severe degree of in-stent stenosis (Fig 4D). Although asymptomatic, the patient resumed dual antiplatelet medication after detection of an asymptomatic in-stent stenosis. He has not developed any symptoms during the 15-month clinical follow-up period after the treatment. A 45-year-old man with an unruptured large aneurysm at the basilar artery tip. A, The posterior view of the 3D reconstruction image reveals a large aneurysm encompassing the basilar artery tip and left posterior communicating artery. B, During the stent-assisted coiling, blood flow compromise through the stented basilar artery to the left PCA is noted (arrow). C, A second Enterprise stent deployment with a stent-within-stent technique immediately restores blood flow completely (arrow). D, The 12-month follow-up lateral angiogram reveals complete occlusion of the aneurysm sac but an asymptomatic severe degree of in-stent stenosis. Intracranial fusiform or ultrawide-neck circumferential aneurysm is one of the most challenging lesions to treat, both endovascularly and surgically. Parent artery sacrifice is often an option for such lesions; however, it is limited in many cases and will require bypass surgery. Bypass surgery may occasionally result in serious complications, and a recent extracranial-intracranial bypass trial was terminated early because of high morbidity and mortality.6⇓–8 Recently, a balloon-in-stent technique has been proposed for the treatment of fusiform or ultrawide-neck circumferential aneurysms.2,3 However, the balloon-in-stent technique is complex and requires experience with both the balloon- and stent-assisted techniques.4 Balloon catheter navigation through a deployed stent may be difficult, especially when the aneurysm is located in a particularly tortuous portion of the parent artery or when it is located distally, such as in the ACA A2 portion. Furthermore, balloon inflation may be associated with particular risk when the parent artery diameter is small. Recently developed flow-diverting devices may be more effective in assisting flow diversion than those microstents that are dedicated to assisting coiling.13 Unfortunately, these types of flow-diverting devices have not yet been introduced in our country. The use of flow-diverting devices may be effective for the treatment of such aneurysms without the use of subsequent coiling.14,15 However, recent reports have shown that these procedures occasionally result in early or delayed rupture of large or giant aneurysms following flow-diverting device insertion.16⇓–18 Although the nature of the mechanism resulting in aneurysm rupture under these conditions is unclear, previous works have suggested that additional coiling may prevent these disastrous events.17,18 Additionally, the flow-diverting devices in their current form may be difficult to apply, especially when the lesion is located distally (eg, A2 giant aneurysm, patient 3) or in the case of basilar tip aneurysm (patients 5 and 7). This is likely due to both the technical difficulties and the risk of perforator infarctions.18⇓–20 The flow-diverting devices by design are wire-braided stents with very high metal attenuation and low porosity.21 When ideally deployed without overlapping of the stent struts, overlapping 3 stents seems to approach the effectiveness of a single flow-diverting device. Thus, the use of ≥2 overlapping stents in combination with coiling may be indicated for the treatment of such fusiform or ultrawide-neck circumferential aneurysms when the application of a flow-diverting device or parent artery sacrifice is not feasible. One of the major concerns with this technique is the long-term patency of the stented parent artery as in the cases treated with flow-diverters. One of the 10 cases with angiographic follow-up showed complete occlusion of the aneurysm sac, which had been initially incompletely occluded but developed a severe degree of in-stent stenosis (Fig 4D). It may represent the positive effect of the multiple overlapping stents on the durability of the aneurysm occlusion but raises a concern for the long-term patency of the stented parent artery. Fortunately, the patient has been asymptomatic after the initial treatment but resumed dual antiplatelet medication after the detection of in-stent stenosis. To address whether prolonged dual antiplatelet medication is required, further experience would be needed in a larger series. There are several limitations of this study, including the retrospective nature, the relatively small number of cases examined, and limited follow-up duration. Nevertheless, due to the fact that these types of aneurysms are rare and are one of the most challenging lesions to treat, the results of this study may lead to a valuable option for the treatment of such lesions and provide the basis for further study. In this small series, multiple overlapping Enterprise stents with coiling are a feasible and effective option for the treatment of fusiform and ultrawide-neck circumferential aneurysms. Further experience and follow-up are required to document the long-term efficacy of this treatment. This study was supported by a Faculty Grant of Yonsei University College of Medicine for 2009 (6-2009-0080). Accepted after revision July 11, 2011.